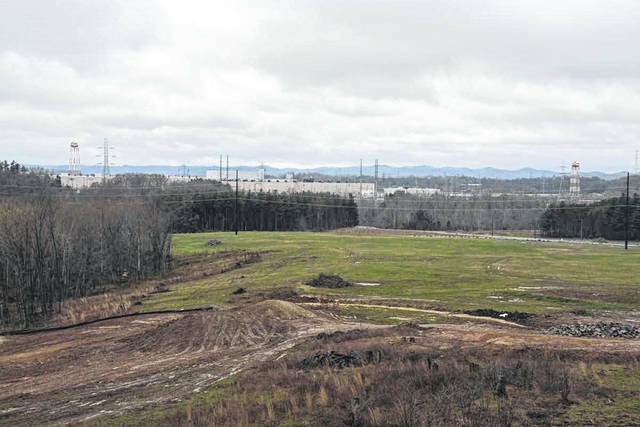 The proposed permanent debris storage facility will sit on the edge of the current Piketon A-plant site. From this angle, the Village of Piketon can be seen in the background. Somewhere, not far from the storage facility, sits an existing municipal trash dump. Johnny Reising, DOE federal project director of decontamination and decommissioning at the Portsmouth Site in Piketon, discusses the on-site waste disposal facility site under construction. The model he’s pointing to shows off some of the materials that will line the bottom of the storage facility, including piping to remove what officials said should be extremely minimal water, or leachate, escaping the containment area. The Department of Energy’s Jud Lilly (left) and Greg Simonton point out the scope and scale of the X-333 Process Building, one of three buildings, each half a mile long, which will be deactivated and eventually demolished as part of decontamination and decommissioning under way at the DOE Portsmouth Site in Piketon. For this shot, Simonton was required to stand in a specific spot so as to block the view of some equipment still deemed classified. Officials would not allow shots of a very sci-fi looking control room inside the same building. The opposition is plentiful, and there’s abundant talk about high cancer rates, alleged groundwater contamination and a myriad of other problems. “This was not an easy decision on my part,” says Portsmouth Acting Mayor Kevin E. Johnson, who ultimately joined the rest of his city council in voting for a resolution opposing creation of what some refer to as an on-site debris storage facility and others simply refer to as a dump. “We just feel like enough is enough,” Johnson continues. He mentions weighing the potential for jobs at the site with issues such as alleged groundwater contamination and similar concerns. City councils in Piketon, New Boston, Chillicothe and other communities have joined Portsmouth in opposing the storage facility or radioactive dump, the title depending on your point of view. A spokesman for Fluor-BWXT/Portsmouth, the private company handling demolition of the Portsmouth Gaseous Diffusion Plant (commonly known as the A-Plant) in Piketon, Jason Lovins says a record of decision already has been filed approving the on-site debris storage facility. Others connected with the project say placing debris from the defunct plant is a safe and logical step, and construction already is under way. Lovins says once the plant was decommissioned, there were always at least three choices of what to do with the facility. One was to simply leave it as is, which Lovins says was not really a practical option. Ultimately, the decision was made to demolish the mammoth plant, which covers some 3,700 acres. The plan is to turn that land back into a productive industrial location, complete with jobs and tax dollars for local communities. Greg Simonton of the U.S. Department of Energy says early on officials discovered they had a major problem in dealing with numerous acres on the overall site already being used as landfill. While those landfills are considered sealed and closed by state regulators, if left as is, that land could not be reutilized. DOE’s Jud Lilly says with those landfills left in place, a map of the overall property would look like a piece of swiss cheese, the amount of land available for reuse severely limited. Lovins says demolishing the plant will create 1.4 million cubic yards of debris, enough to fill Paul Brown Stadium in Cincinnati. What to do with all that material was obviously a question. While opponents of the new landfill or storage facility argue it will be radioactive, Lovins, Simonton and others all say the most hazardous material has and will continue to be shipped off site. Only materials with what was described as extremely low levels of radiation will go into the permanent on-site facility. Nevertheless, officials say materials placed in storage need to be covered with dirt of some kind. Voids between the piled materials need to be filled in. That’s where materials from the existing landfills come into play. Those materials will be used essentially as filler in the storage facility. Lovins and Simonton both say doing so will free up for redevelopment the acreage now used as landfill. What types of materials are in the existing landfills? A former plant worker, Vina Colley, is the outspoken president of Portsmouth-Piketon Residents for Environmental Safety and Security (PRESS), a grassroots group bitterly opposed to on-site storage of plant debris. She likes to talk about how an entire manufacturing plant from West Virginia was buried on the Piketon site. Simonton and Lilly don’t deny that for a second. Colley also charges there was plutonium at the Piketon site. Again Lilly, didn’t hesitate to say there was, in fact, plutonium in the Piketon facility, which was used primarily to increase the radioactivity, or assay, of uranium. Lilly says what he calls minuscule amounts of plutonium were brought to Piketon for enrichment. Although Lovins and others talk about how some aspects of plant operations still are considered classified, even limiting what photos could be taken by the media inside the plant, during a brief tour of the Piketon facility, Lilly never indicated the presence of plutonium at the site was ever a secret. With a doctor’s report to back her up, Colley claims she suffers from numerous health problems, ranging from pulmonary edema to a chronic respiratory condition, all of which she alleges results from the time she spent in the Piketon plant. On that front, Colley apparently is not alone. Each claiming they were sickened during their time at Piketon, a group of former plant workers meets monthly, Colley says. Most are seeking or receiving some sort of compensation from the federal government. The on-site storage facility will cover about 300 acres in total, although only about 100 acres will contain fill. The rest of the property will be used for support facilities, according to J.D. Chiou, a DOE scientist working on the design of the storage facility. He and Johnny Reising, DOE federal project director of decontamination and decommissioning at the Piketon site, brags about how the storage facility will be essentially a sealed vault, one which will stay sealed for 1,000 years. Chiou and Reising emphasize no water, or leachate, will be able to escape the facility due to several safety precautions, including a thick, hard non-porous liner along with several feet of stone and specially compacted clay. Three, double-walled leachate tunnels will collect any water that does escape containment, funneling it off to an on-site water treatment plant. Chiou notes that unlike municipal garbage dumps, methane gas will not be a problem at the Piketon storage facility. No materials which would generate methane will be allowed into the facility. Colley mentions numerous times that the proposed storage facility will sit on fractured bedrock. Reising and Chiou readily admit that’s the case, but claim careful studies show there is no clear path from where the fill material will sit to any water table. Chiou says while the technology being used at Piketon is state-of-the-art, it is not new technology and it is proven technology. Fill should first arrive at the storage facility in 2020. Permanent capping should begin about 10 years later. That cap will consist of layers of stone and other materials. Eventually, prairie grass, chosen because it will help hold the soil in place, will cover the top of the storage facility. Reising mentions briefly a similar facility which now includes deer and other wildlife roaming around. Officials say the storage facility will remain federal property in perpetuity. Although they had plenty of information well beyond what is presented here, the arguments made by Lovins, Simonton and others connected with the Piketon project are very unlikely to pacify Colley and other opponents. Nevertheless, Lovins points repeatedly to the decision of record, and he and the other officials all seem to consider the storage facility is a closed issue and a done deal. Piketon Mayor Billy Spencer did not respond to several requests for comment for this story. Johnson said even though federal officials seem to consider the matter closed, there may still be room for compromise. “If there is enough of an outcry, they may be willing to take a second look at this. That’s all you can hope for,” Johnson concluded. https://www.portsmouth-dailytimes.com/wp-content/uploads/sites/28/2018/04/web1_piketon-dump-location.jpgThe proposed permanent debris storage facility will sit on the edge of the current Piketon A-plant site. From this angle, the Village of Piketon can be seen in the background. Somewhere, not far from the storage facility, sits an existing municipal trash dump. 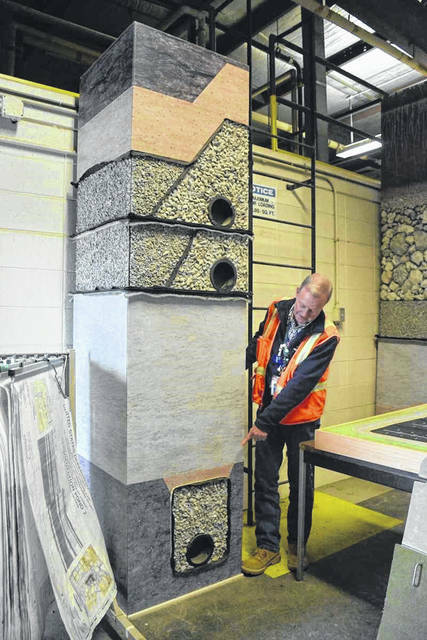 https://www.portsmouth-dailytimes.com/wp-content/uploads/sites/28/2018/04/web1_fill-example.jpgJohnny Reising, DOE federal project director of decontamination and decommissioning at the Portsmouth Site in Piketon, discusses the on-site waste disposal facility site under construction. The model he’s pointing to shows off some of the materials that will line the bottom of the storage facility, including piping to remove what officials said should be extremely minimal water, or leachate, escaping the containment area. 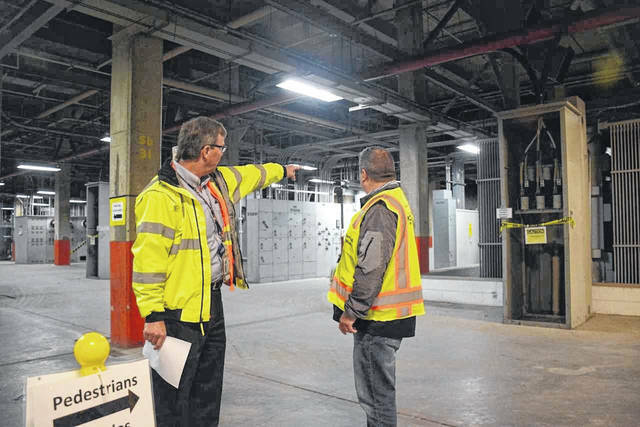 https://www.portsmouth-dailytimes.com/wp-content/uploads/sites/28/2018/04/web1_sci-fi-stuff.jpgThe Department of Energy’s Jud Lilly (left) and Greg Simonton point out the scope and scale of the X-333 Process Building, one of three buildings, each half a mile long, which will be deactivated and eventually demolished as part of decontamination and decommissioning under way at the DOE Portsmouth Site in Piketon. For this shot, Simonton was required to stand in a specific spot so as to block the view of some equipment still deemed classified. Officials would not allow shots of a very sci-fi looking control room inside the same building.